I decided to start a new Monday series, "MOMables Monday". 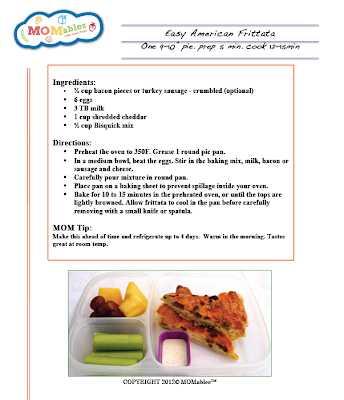 Each Monday I'll feature a MOMables meal plan lunch for Little Miss. They really are so great when looking for inspiration and healthy menu ideas! Little Miss has a gluten free bacon, egg, and cheese frittata. I also used gluten free bisquik mix, to make it friendly for her diet. In lieu of celery, she has carrots and dip for her veggie. Her fruits are red seedless grapes and freeze dried banana slices. In the main compartment of her EasyLunchBoxes container are also three "hunny bunny bites". 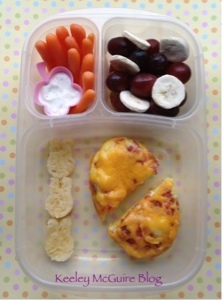 I love that I can take a MOMables lunch to get inspiration and adapt easily to be gluten and peanut free for Little Miss! You can view your own FREE sample menus on MOMables to see what it's all about AND they're still offering a FREE download of a weeks worth of menu planning. You are such an awesome mom! Little Miss is very lucky to have you. I wanted to let you know that the gluten free diet has been a total blessing for my son. Going on a month now, and he has already grown an inch since we switched and no more stomach issues. Isn't it crazy how one ingredient in foods can cause such issues? Great idea with the frittata! Looks delicious! What a great idea!The lunch looks yummers!